← Laughter is the Best Medicine! 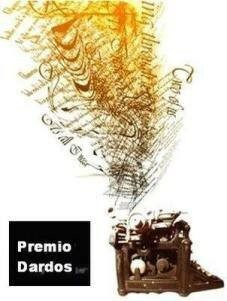 What a delightful surprise and honor to receive this nomination for the Premio Dardos Award from David Brian Paley at Vancouver Visions http://vancouvervisons.com – an award that recognizes cultural, ethical, literary, and personal values in the form of creative and original writing. Visit Vancouver Visions and enjoy David’s writing. He’s working on a novel, and a couple of long reads. And of course there’s his poetry! Like David I had stopped accepting awards in favor of spending more time writing. But, I’d accept any award that had to do with writing itself and promoted other writers in turn. 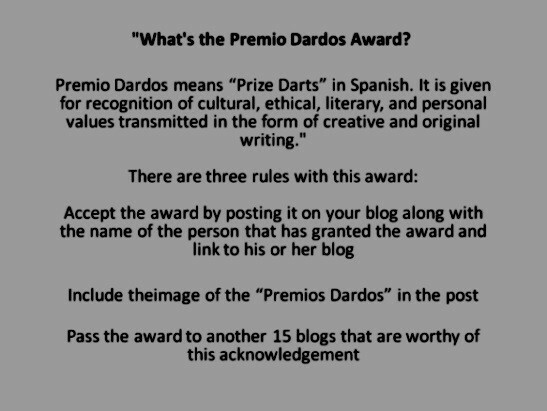 So, this is my chance to enjoy this award, and to nominate 15 fellow bloggers that I admire for their writing ability. A good feature of this award is that it doesn’t require answering questions or making up questions, and there’s no article that must be written upon acceptance. Plus it has a very cool logo, an old manual typewriter with a scroll of words streaming from it. I’d like that magic stream of words to end up on my computer screen! I must admit, it was difficult to narrow it down to 15 amazing blogger friends for this award. And of course some that I’d like on the list have declared award-free zones. So, for my nominees, it’s your choice to accept or not. I’ll be happy if you do, and understand if you don’t. I’ll continue to follow and love your writing anyway! No Facilities – http://nofacilities.com – Dan’s photographs are awesome. He’s also a woodworker, cyclist, Geek, and writer. Automotive work is his hobby. Wandering Iris – http://irisgreenwald.wordpress.com – Iris loves to wander and take road trips. Her photographs and write-up of the places she goes are incredible. Bluefish Way – http://bluefishway.com – Ralph lives in Spain and his blog is colorful, and serious with lots of humor and photographs. I’d like to acknowledge his site and his writing. Silver Threading – http://silverthreading.com – Colleen is the Fairy Story Keeper for the story about the Swamp Fairy. She has a lifestyle blog that will keep you interested and entertained. Eric Tonningen’s Awakening to Awareness – http://tonningsen.wordpress.com – Eric creates awareness for Baby Boomers (and others) around ways in which choice can shift one’s focus. Vanbytheriver – http://vanbytheriver.wordpress.com – Vanessa is a writer, teacher, photographer and student of life. She loves poetry and music. Her dream job is to be a motivational speaker! Nicholas C. Rossi – http://nicholasrossis.me – Nicholas is an author who lives in Greece. His book for young readers, Runaway Smile, is a delight. He’s the author of the epic fantasy series Pearseus and a science fiction story, the Power of Six, both at #1 on Amazon. Poetic Parfait – http://poeticparfait.com – Christy’s blog site invites you “to read poetry and enter discussions about the poetic word, listen to music and embrace words that tend to inspire.” She has a first poetry collection on the website, Pathways to Illumination. Photo of the Day, Etc.- http://photooftheday.com – Timothy Price specializes in daily art, documentary and promotional photography. His photos are pretty awesome! Smorgasbord – Variety is the spice of life – http://smorgasbordinvitation.wordpress.com – Author Sally G. Cronin lives in Spain. She’s published books and developed Indie Moyhill Publishing. She has many writing talents and her projects are a health book focused on the care of the elderly at home, and a people management development programme, and a novel. Myths of the Mirror – http://mythsofthemirror.com – Diana Wallace Peach loves to write and has sci/fi fantasy books that will delight and hold your attention. She’s also a poet. You’ve Been Hooked – http://youvebeenhooked.wordpress.com – Robert, the bellman, has a career that “requires a few people skills, a loud voice at times, and plenty of ingenuity.” This stories about “his job’ are funny classics. He also writes “What the Bellman Saw” for Bullet News Niagara. Megdekorne – Doorway to Jubilee – http://megdekorne.com – Meg is a talented writer. Her stories are descriptive and compelling with exceptional photographs for visual effects. Her continuing story, Beatitude Point, is one of my favorites. Not Another Tall Blog – http://notanothertallblog.com – Angie K’s “an expatriate, a busy tall Mum of two who loves good books, movies, heavy rock music, progressive metal…and writing” She has a lot of categories on her site and some great writing! Bipolar for Life – http://bipolarforlife.me – Laura Shulman, MD, MA has a huge following and many informative blogs about her experiences in life and living with Bipolar Disorder. She is an extraordinary writer and captivates her audience with a variety of interesting topics. That’s all folks! Now I’ll personally notify the nominees after I publish this acceptance post. Laugh and Stay Healthy, and above all Keep Writing! This entry was posted in Awards, My Blog, My Entries and tagged Delightful, easy to accept, Nominator David Paley, Nominees given writing recognition, Premio Dardos Award, Prize Darts, Recognizes values in writing, Vancouver Visions. Bookmark the permalink. Congratulations. I’m familiar with some of your nominees and they are indeed worthy choices! Thanks, Robert! I agree, the nominees are exceptional writers! Thanks so much! It’s a nice award and easy to accept! Congratulations, Christine! Thanks for the nomination. Even got in a blog a day during the 5 weeks we where in France in 2013. Well done and some great blogs in there too! Thanks so much. Yes, I thought so too. Some very talented writers and photographers to follow! Thank you so much Christine and I am very honoured to accept this award. Awards are precious things especially when offered by fellow bloggers and writers and now that I am clear of house renovating and have more flexibility in my schedule I will do my best to respond to these generous nominations as soon as possible. Thank you so much! They are a talented group of writers! Thanks so much Christy! You’re deserving of it too! Glad you like the nomination! And the nominees! The Blogosphere has some great writers! Congrats again, Christine, and thank you for the nomination. I’m honored to be in such great company. I’ve found so many great bloggers through your site. Appreciate your continued support and unique kindness. ☺ Van. Sheldon, you sound very busy! I’d think all of those things need to be done first before blogging! Post once in a while and by happy! Unless you want to be a power blogger! Ha! That’s a wonderful post you’ve written here, and I thank you for the much more than kind mention that you gave me. I apologize for the amount of time it took for me to answer this, but it should give you some idea just how backed up my email is. And then because of the way that I answer my email, some of my newer mail gets answered before the previous, and it doesn’t take long before I’ve got the whole thing messed up. Lol. But I thank you again, and congratulate you on the award, I was really happy to be able to nominate you for it, both you and your site are very deserving of it. So a good day, keep up the great writing, and will read you some more later. I am so glad you did this, thank you!